Hello, Welcome to our blog following the renovation of our Victorian house, a four bedroom property in the West Midlands. A builder, a designer and a crazy kitten, what could possibly go wrong!? We’re excited to be part of the Amara Design Awards 2015. If you’d like to vote for us, you can click on the icon below, thanks! Nothing can go wrong! Good luck with the project. Thank you, hoping for no ceiling collapses… Your poor sofa. Can’t wait to find out – thanks for following me – now I’m following you and trying not to be jealous of your Victorian adventure! Thank you right back! Though no need to be jealous… Currently trying to ‘cook’ under about a mile of plaster dust… Dislike. What can go wrong, everything when Andy is in charge !!!! Shouldn’t you gentlemen be making cranks…? His involvement is manual rather than managerial! I am glad that you found me via the blog world, which in turn lead me to your blog. This little kitten with the beauty mark on her (his?) lip is too adorable! I like what I have seen so far and look forward to reading more. Thanks for following me! Thanks right back! 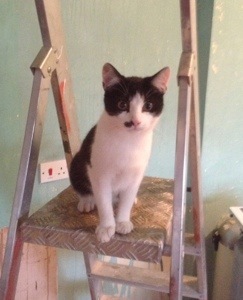 That kitten is a mischief-maker, and tries to ‘help’ with everything, the kitchen fitters arrived at 6.30 am today, she’ll have given them hell on paws! How people do this with children is beyond me! What a cute kitten! I grew up in a Victorian house with loads of original features, I miss it like crazy. I’m nominating you for 2 awards – you deserve them both! Thanks for making my blogging experience a great one with your comments. Check out my last post to follow the instructions should you choose to accept. Thanks for stopping by! Now to read all your posts. I am new here. What year is your home? I love victorians but I can only imagine the work involved to bring it to its full glory. I am in a small, low ceiling, no frills cottage. I have to be imaginative to bring it to life life. Victorians already have the frills but you have to put a lot of elbow grease to bring out the thrills. Good luck!! Hi, thanks for the visit! We think around 1880, the original documents are a little shady… My last house was an 1890 workers cottage, no real features but just had the cosiest atmosphere which sometimes lacks in victorian houses…hopefully we’ll get a bit of it in this house one day! Nice!! Good luck in your adventures and I will be checking in catching up. I am off sick for a few weeks and reading reading reading. Thank you. Hope you are better soon! Thanks for the follow. Your blog is so much better designed and content rich than ours. Good luck with the project. Ha ha, it’s not at all, it’s only looks half decent because i’m a designer so get preoccupied with the aesthetics… But everything else, like actually doing anything…generally goes to pot! Good luck with yours too, looking forward to seeing your progress. Hello, I love your style! I’m from Lansdowne, PA. Is that where your home is? I googled “Lansdowne Library images” and you popped up! Hi, thanks for visiting and glad you like it! No we are across the pond in England, our house was once called Lansdowne, hence the name. I learn with interest there is a place called Lansdowne!